Flourless Peanut Butter Muffins that are vegan and gluten free. You guys! I have a treat for you. Vegan peanut butter muffins. It gets even better. 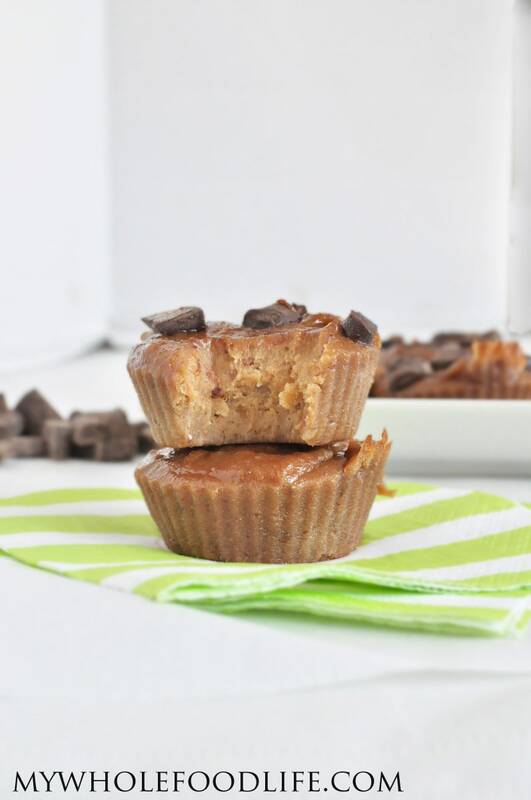 It only takes 3 simple ingredients to make these flourless peanut butter muffins! This recipe is super easy, requires no mixer and has no added sugar! If you like flourless recipes you may also want to try this and this. These flourless peanut butter muffins are so good. They are vegan, gluten free, egg free, grain free and dairy free. You can even keep them paleo by using sunflower butter or almond butter. I used peanut butter in this recipe because my husband loves it. I do think these muffins would be fabulous with almond butter though. One thing I have to point out is that these flourless muffins have a slightly different texture than traditional muffins made with flour. I think they are totally delicious, though. To see a chocolate version of this recipe, watch the video below. For more videos, you can subscribe to my You Tube Channel. Only 3 ingredients to make this healthy treat! In a food processor , mix all three ingredients until everything is blended well. Spoon batter into standard sized muffin pans . The muffin pans need to be greased or lined. I use silicone liners for mine. Let them cool completely before removing from the pans. I added some chocolate chips to the tops of mine. They were great that way! Store these muffins in an airtight container in the fridge. The should last about 4 days. Enjoy! Does 3 dates equal 1 egg or what is the measurement? If I had to guess, I'd say 1 egg.